This is a winery built by Norman Foster. It is a unique winery. It does not follow the regular wine making process. In fact, it combines tradition with modernity to dole out the best wine that has ever been made which is even ranked among the top 10 best wines in the country. This is a family business that has been in operation right since its conception. You can look at the Vines, the barrels and the manufacturing process and also partake in a wine tasting session. The Restaurant – You can visit this restaurant and taste the scrumptious food and the lip smacking wine. The Vinoteca– This is where the Vines for the wine come from. Book your tickets in advance as far as possible. Be ready for wine tasting. There is an EUR 5 express tour. Tours start on 11 am, 12:00 pm, 4:30 pm from Monday to Saturdays. Tours start on 11 pm, 12 pm and 6 pm on Sundays. How popular is Bodegas Portia? 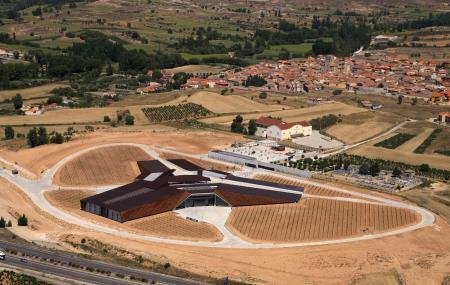 People normally club together Ermita De La Virgen De Las Vinas and Cines Victoria Ribera Del Duero while planning their visit to Bodegas Portia. This is an architectural exampl of functionality. Designed by Norman Foster this winery is made of new materials and uses the shape of a flower and in each petal a different moment of the production of their wine! Really loved their wine too! Higly reccomended if you are in the area! Great experience and our guide Jowita was absolutely amazing. She answered all of our questions and gave us a great tutorial. Very cool and stylish winery with amazing restaurant, killing view and excellent wines! Very impressive architecture and design, however the winemaking process feels more influenced by Mr Foster than the winemakers at Portia, and you can't seem to shake that in the tasting. What a neat winery! We really enjoyed the staff and their wine is delicious! Can't find this in the US, so be sure to grab a few bottles to bring home.